The symptoms of a car not accelerating like it used to can occur on many high mileage vehicles. 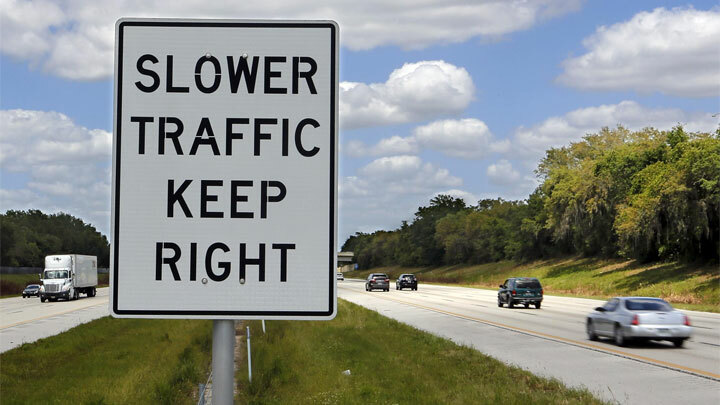 A driver might not notice these signs in normal day to day driving but they become abundantly clear when driving up a steep hill or when quickly trying to accelerate into fast moving traffic. It is in those situations that drivers will come to notice the obvious slow acceleration and the fact that the engine of their vehicle is struggling to keep up. The mass air flow sensor (or meter) is located and attached to the inlet air cleaner. Since the function of the air flow sensor is to measure air mass that is flowing into air intake, a clogged or bad mass air flow sensor could send the wrong data to the engine ECU for calculating the air fuel mixture. A symptom of an air flow meter malfunction is car that won’t accelerate correctly. An oxygen sensor is device whose function is to monitor the exhaust emissions of the vehicle so that it can analyze the air-fuel ratio going through the engine of that vehicle. To make a long story short, a car needs a proper amount of fuel in order for the fuel to burn properly in the combustion cylinders so that it may run smoothly and may accelerate as required. 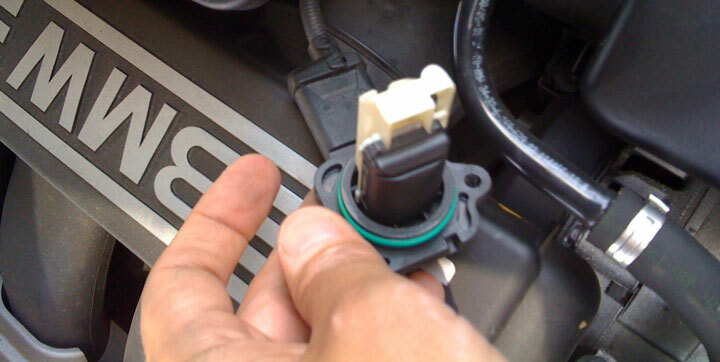 This sensor sends the information about the amount of fuel being used to the computer unit of the engine and if this sensor get damaged, then the engine of that vehicle will have no idea what ratio of air-fuel mixture to use which may result in a fuel rich mixture. This can cause the slow acceleration of the vehicle even with the accelerator pedal completely pressed making it unreliable when it’s needed. The basic principle of the throttle position sensor (TPS) is to detect the throttle valve opening angle which is controlled by accelerator pedal. Then the TPS will send this data to the ECU. If the TPS malfunctions, the engine speed cannot be controlled by the accelerator pedal and engine speed will increase or decrease without any press or depress the pedal. A dirty or clogged fuel filter is another reason for a car not accelerating like it’s supposed to when required to do so. With a dirty fuel filter, the engine won’t be getting enough fuel which means that the vehicle won’t be giving the acceleration performance that it should. Replace the fuel filter as soon as possible. Just like a fuel filter provides the engine with the clean fuel, an air filter provides the engine of a vehicle with clean air to be used in the air-fuel mixture which will be sent to the combustion chambers to burn. 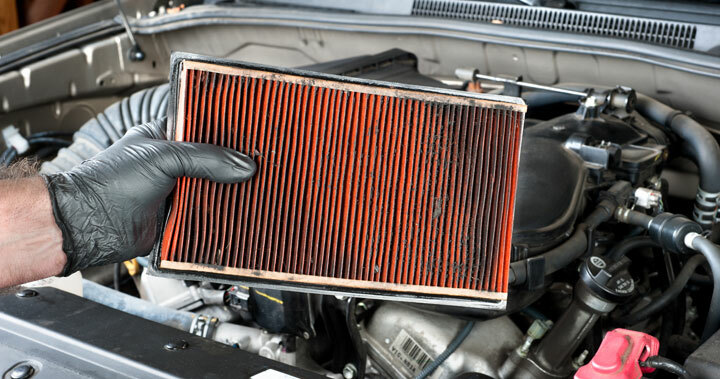 If an air filter is clogged, then the engine won’t get the right air-fuel mixture resulting in slow acceleration. Replace the air filter as soon as possible. This component is as it sounds. 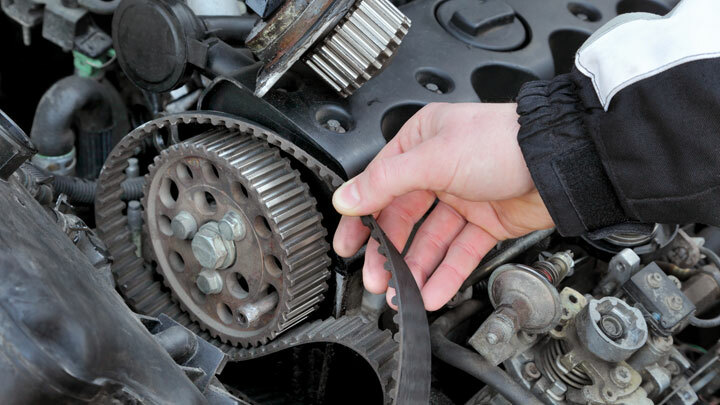 The timing belt is something like a VIP in the list key of components of an engine. If this belt is off even by 1 tooth, it may cause some pretty notable acceleration problems. However the list of causes of poor acceleration does not end here. Other culprits behind slow acceleration may include a slipping clutch, the transmission system itself, or an unexpected or unrelated problem which may surprise even veteran mechanics. If you’re not comfortable troubleshooting a car that won’t accelerate, I recommend taking the vehicle to a reliable mechanic and let him give it a full checkup. This will allow him to properly diagnose the issue and recommend a suggested fix. I have a 98 ford ranger that occasionally looses power & won’t accelerate. Can happen anytime on freeway or surface streets. It only last a few seconds then it’s ok again. No smells, no warning lights, nothing to indicate a problem. Mechanics can’t find any problem. Replaced battery then fuel filter then idle control motor. Still same problem but only for seconds & can go 200 to 1000 miles before it happens again. Can’t keep fix in stuff it isn’t. Any suggestions? it so complicated, so the problem comes sometimes and take only for a second? i mean when problem occur, it continuous or just a second then comeback normal again? i had a similar issues with a 94 ranger it randomly happened throughout the summer. i ended up needing my alternator replaced. Have to replaced fuel filter and all of that? I would say if yes then I would change where you get your gas some places will sell bad gas or have leaks in their ground holdings that allow water or contaminates in. Sounds like the fuel systems just flushing out something bad every now and then and struggling while processing it through the motor. A slipping clutch can be the cause. Better to change the automatic tramission gear to another. I had the same issue with my land cruiser had to change the air flow sensor. Could be that your car is driven in very cold weather. Happens with most cars. However, after it warms up, the problem should be gone. If not, then it’s something else. My 2010 Nissan Altima has the same problem, did you ever figure it out ? I have an 02 avalon, no acceleration, burning smell. Cat Converter is brand new, new O2 sensor, new knock sensors. many possible causes of your case. is there any smokes coming from exhaust? I have a 2005 Toyota Camry drives normal for a while then just stops, motor is still running but when you push on the gas pedal it does nothing. I can shut the car off and restart it and I will drive fine again for a while. I have a 2014 Toyota Corolla Axio, where the gas pedal is not accelerating when pressed. When I got it checked out, the mechanic is saying that the ECU is damaged. Could this be the case? On my car the coil packs were causing it to not accelerate. Had to replace them, more than once. There is something (many things!) wrong with Dodge Darts. I have a 99 Chevrolet P/UP 5.3L , I’m having acceleration problems, the odometer jumping up to 25mph. to 35mph. then down to 0. The break light flashing, and vehicle will not go fast, all you hear is the motor rising. Any words of wisdom ? I have a 2012 Nissan Note and I was driving it one day up a hill/slope and it wasn’t going when I pressed the gas pedal. From that day I was not able to accelerate and my car not driving the same anymore. I have a 2003 Subaru legacy L sedan and when I come to a stop and then press the gas pedal it’s almost non responsive and sluggish. I have changed the fuel pump and I’m going to change the pcv valve but I don’t know if that’s going to fix it please help. I have a 1989 BMW 325i and when i floor it the rpm’s go up but it doesnt accel like a normal car its only got 200xxx miles on it, any help? I have a 2001 Ford Taurus that when I hit the gas it goes slow maybe like 20 mph. It just started last night. I was told to put transmission fluid in it. 94 town car,door fine on streets but on fwy only goes about 57 and a bit of burning smell. I have Mazda6, 2004. It does not accelerate after starting. I have to warm the engine for twenty minutes, then it runs smooth. No acceleration prpblem then. Moreover, overdrive option turns on by itself sometime while driving. i have 2007 Hyundai Matrix 1.8. In the past couple of months my engine check light has been always on and when i checked with a local workshop on the issue, initially it was said to be O2 sensor. Once they had changed the O2 sensor the real problem started, only after a couple of days (1 or 2 days) first the engine check light came on again and later on the car starts to decelerates abruptly to a near stop. I had to stop the car to the side and turn off and on the engine again to get it to running again. I had brought my car to the workshop again to be checked and this time they changed the gearbox, the fuel injector and the fuel pump but to no avail. The error on the engine check light showed to be the O2 sensor so the workshop technician could be due to a dirty engine manifold and sent for cleaning. But still the problem exist, even the workshop themselves have given up on what could be the issue. My patience has been running thin and the frequency the car stop abruptly has increased. Please help me as i am really clueless to solve this problem. Thanks. I have a 2012 Chrysler 200, when the AC is on my car seems to act sluggish and won’t accelerate very well. Any suggestions on what to have checked? I have a 02 buick century & when I drive my car wont accelerate I had a street mechanic look at it & he say its my upper ..oxygen senor..all I know is when I drive it takes a long time to pick up speed no matter how hard I press on the peddle & its usually a lot of white smoke to what do you think the problem could be? The oxygen Senor or maybe something else?? My is Peugeot 206 it also won’t accelerate mostly on a hill,any suggestions? I have a 2002 pontiac montana. It accelerates slow when I reverse and drive forward. What could be wrong? I have a 2005 chevy impala and my problem is that when I am at a red light the car will not go forward even though the car is running. There is no rough idle it just doesn’t accelerate. I turn it off and try again it accelerates briefly then loses acceleration. What could be the issue? I have a 2013 Nissan Versa that will be slow when I take off from a light and then shifts to a normal speed. Ive used fuel cleaner, fuel injector cleaner, but I have not had a oil change for about 7000 miles.what do you think the problem can be and about what would it cost. I have a nissan 2011 sentra that isnt aclerating properly or at all i cant go more up that 10per/m after i hit the curve i already changed both of my tires but now im having this problem and its also haveing a rotten egg smell and most of my dashboad lights r on. What could this be??? I have Hyundai accent 2002 auto car.some times when accelerated engine is not speedup.try to knocking. ( while running)why it happen? hey my accelerater goes to the bottom when I press it without me trying and the fastest it will go is very slow it wont hardly move when I make it go all the way down can u help me. is it because I don’t got an air filter my air filter is piping out the bonnet. Nissan serena 2008 model problem climbing uphill,changed the spark plugs but still nothing has changed on normal road it’s fine and performs ok.
2014 nissan versa. While turning car wouldn’t accelerate. car rocked back and forth with Rpms going up. Car finally accelerated. Took it to the dealership b/c it is still under warranty. dealership can not duplicate the problem. I have a 2009 Kia Spetra that has over 200K miles on it. I was driving on the surface streets & after I came to a stop at a traffic light, when the light turned green it would not accelerate. The engine was still on, I pushed the gas & the RPM indicator arm would go up but the car wouldn’t move. I tried it in other gears like 3 & 2 & L but nothing. Reverse oddly enough worked fine. A friend of mine that works on cars thinks it might be the transmission but didn’t rule out a fuel pump, front axles, or sensor. Any ideas? I have 02 Toyota Camry. For the first time the acceleration of car went down . The more I press the pedal the car won’t move fast , just making noise. What could be the problem and a quick fix to get to my destination. Is it safe and advisable to continue moving the slow moving car. I have a 2012 chevy cruze. It keeps jerking when accelerating I replaced the mass air flow sensor, both o2 sensor,and throttle body. It stopped jerking but sometimes it lacks power when accelerating now. I have a 2013 dodge journey about 88,000 miles on it. Was on highway in traffic hit gas to accelerate card made a load whining noise barely moved, i pulled over shut it off and its been ok but im a little nervous. What could make this happen? I have a similar problem, my car is Honda EOD 2003 V6. It won’t accelerate at all or even pick up eventually. Its just dragging and sucking my fuel like no man’s business. Please i need urgent help. And if the engine light is on what could it mean? I have a 97 Acura 3.0 CL, it’s making clicking noises on the passenger side by the dashboard. It starts, will drive, but at a certain distance it won’t let me accelerate when I press the gas. I can turn it off and wait a few and it would start back up and drive again. What might that be? My car is revving itself and when i press the accelerator it does not respond what might be the problem because the car is travelling at 20km per hour. is there check engine light on? My car will go along fine at any speed, then suddenly it feels like the brake is applied, car slows down alot, have to gear down to fourth or third, floor it and eventually will pick up fuel and take off again. Replaced 2 ignition coils (used) about 5 months ago as was doing this before and worked good since, but has started acting up again. New plugs but not wires. 04 echo. Do you think it’s these again? Anything else it could be? Hi.. My car is a 2006 Hyundai accent and it’s not accelerating in drive or in reverse it just lets me roll backwards there’s no awkward sound my car still starts up do you know what the problem might be? Hmmm.. am using Ford Fiesta 2011 model and for past 3 years I Ve been enjoying this car till I had the issue of overheating which has generated a lot of problems which I can’t even explain. They changed the gasket Nd so many parts of this car but the problem Stil persists. What should we do again to resolve this problem? Thanks. Sometime it show some air licking type syptoms..
My daughters 2002 Infinite’s check engine light came on the other day and last night coming home her car wouldn’t accelerate over 60. When she got home it was running hot. What could it be? 2002 GMC Sonoma…truck goes into gear without hesitation or slippage, but will not accelerate over idle speed, maybe 5 mph. Engine races with acceleration but does not result in movement of the truck. I have Toyota spacio, the acceleration doesn’t react quickly especially when the engine has been idle for sometime, but when the engine has warmed up its very ok. what could be the problem? I have a 2008 Hyundai Sonata. On two separate occasions after I started the car it would not accelerate or rev at all, though it would idle and move forward in idle. In both instances turning off the car and starting it again (rebooting it?) fixed the issue. Any ideas? And Thank you. I have Mazda Axela 2004, in traffic when I pressed accelarate, speed and RPM very slowly increase but after 3_4 second the RPM suddenly increase 3_4 thousand and the car speed very high, what is the problem??? I have a 2012 Toyota Etios Liva drives normal for a while then just stops, motor is still running but when you push on the pedal it does nothing. I can shut the car off and restart it and I will drive fine again for a while. And the engine light on from that moment. I have a 06 Lincoln Mark LT 2WD. Its having issues while I accelerate it. It almost makes a “jumping motion” when it starts to bog down some. Not sure what is wrong with it. Cat. Converters have been cleared out, and plugs are good. My car is Mercedes c320, it will accelerate and after sometimes it ceases to until I turnoff the engine and start it again before it can accelerate again and the process starts all over. What is the possible cause of this? i have 2006 peugeot 407, it wont accelerate when i press the pedal. what is the cause please? When I am on the freeway of any open road driving between 80-120 km/h with my foot on the gas , after a while it just slows down while my foot is pressing down on gas. Then when I leave the gas pedal and place my foot back on the gas pedal it accelerates again. I have changed the fuel pump , there are no smells , no leaks on the ground and no emergency check lights comes on and no sound. I use a 2007 Camry,my battery ran down and after jump starting,the car came on and just won’t accelerate at all,flat on 0,the gas pedal seems for fancy,I asked a mechanic to check,he said fuel pump,and next thing he said the gas pedal has to be replaced that he found out the car pumps fuel just fine,I asked him to return the pedal and I’ll get back to him. flat 0? mean the car even not run at idle? I have a 2005 Honda Accord ivtec, 4 plugs. The current mileage is about 110000. I changed the gear box recently and since then the car experiences poor acceleration. When started, the car will run normally for about 30 minutes but once there is a little hold up and car was on and ac running problem starts. When I trottle the car will not accelerate and when I continue matching the trottle the car starts to shoot and often grounds to a halt. When I switch the car off and restart, the acceleration becomes normal for a while before the failure to accelerate repeats. I have also noted that the car doesn’t easily accelerate beyond 100km/h. My technician attributed the problem to the raising switch which he brought out and cleaned. The problem stopped but reappears after some days of driving. I have also had to change the plugs and had the nozzles serviced. Please help me with useful information.Thank you. Have a Mercury Mountaineer 2007, yesterday coming from shopping, my car was working normal, suddenly at a red light, stopped responding when tried to accelerate and stayed that way every stop light on my way back home, before get there, stop to buy some groceries. After that the car was back to normal. Have you had your car scanned for any DTC (trouble) codes? A bad ABS sensor shouldn’t cause something like this. Your car may be in limp mode (can you shift through all gears?) or another serious issue. I’d recommend getting the check engine light code scanned asap. Your vehicle may be in “limp mode” which is a safety precaution when the car’s computer recognized a serious issue with the engine or transmission. You should get it scanned for any trouble codes. I’m actually in the process of creating a new post on this topic but it unfortunately won’t be published for a few days. I have a 1999 Toyota Solara. My check engine light flashed on and off a couple times when I tried to accelerate up a small incline. It was also very cold out that particular night. It has about 120k miles on it. We ran a code scanner but nothing came up. Any suggestions? It was struggling to accelerate and would stick at 2000 rpms. Then the check engine light would flash on and off. If the check engine light was flashing, there should be at least 1 trouble code stored when you scan it. If the car simply wouldn’t go past 2000 RPM it could also be in limp mode signaling some major issues. I’d recommend getting it scanned again in case the scanner itself was faulty. Go to a local Autozone if needed as they’ll scan it for free. 2005 Altima, 178,000 mi Car will rev in park, when put in drive or reverse will glide forward or backward however when accelerating to actually drive will not go even with gas pedal pushed all the way down!!! Check engine light on. What could it be? Am going to have to have it towed. 2011 ford fusion , driving normal then sudden lost of power , wont accelerate . but is all good after i shut it off and restart. I’d get it scanned for any trouble codes asap. Your car may be in limp mode which is often reset after a restart.